. : Home : : History : :Mail Orders : :Products : : Mincemeat : : Roasting Pigs : : Venison Processing : . 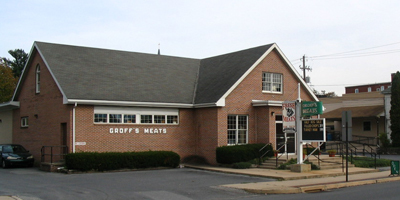 Groff's Meats is a local butchershop located in Elizabethtown Pennsylvania and run by the family's fourth generation owners. Groff’s Meats sells retail and wholesale meats including; beef, pork, poultry, deli items, and specialty foods. These include both fresh and smoked meats. Give us a call to place an order or visit us at 33 North Market Street. Groff’s Meats is proud of both the quality and care which goes into making each of our products. It is our goal to serve these products to our wholesale and retail customers with pleasant, efficient, and food safe service. Our food safety program consists of a USDA federal inspection program with a HACCP (Hazard Analysis Critical Control Point) plan for food safety. The implementation of this program helps to ensure that our products are safe and wholesome for our customers to purchase. Our retail store has personnel trained in the Pennsylvania Safe Serve Program as mandated by the Commonwealth of Pennsylvania.